We dug into Navient’s quarterly earnings report following the passage of the Tax Cuts and Jobs Act of 2017 to find out how the company planned to use their massive corporate tax windfall. It turns out wealthy Navient shareholders will be reaping virtually all of the $204 million tax cut benefits at the expense of student loan borrowers. Last December President Trump and congressional Republicans enacted a $1.5 trillion tax giveaway to corporations and the top 1 percent of earners—a law that the Congressional Budget Office projects will cost our generation $1.9 trillion over the next 10 years. At the time of its passage, congressional Republicans and their donors made the argument that these tax cuts were going to benefit the average American and were going to give a much-needed boost to workers and middle class families. CEOs of major companies went on television announcing one-time-only cash bonuses for their employees, crediting their generosity to the tax bill. It doesn’t take a tax expert’s read to see that by borrowing $1.5 trillion from our generation’s future, this tax law takes wealth away from investments in vulnerable young people and funnels it to the ultra-wealthy. Not only do the individual tax break provisions (which it is worth noting expire at the end of 2025) skew towards the already wealthy, giving only crumbs to low- and middle-class young people, there is no evidence that the corporate tax breaks are trickling down to benefit working young people. This dangerous law is hitting our generation at a time of already staggering levels of economic instability, the evidence of which is seen in the fact that 46 percent of Americans aged 18 to 24 years have $0 in savings. We know that a major driver of this economic insecurity is rooted in the student debt crisis. The majority of college students, and 42 percent of all 18 to 29-year-olds have student loan debt. The average student debt load upon graduation for the class of 2016 was $30,100. These unprecedented debt levels are being incurred at a time when 30-year-olds today make around the same amount of money as 30-year-olds in 1984, despite the fact that they are 50 percent more likely to have finished college and that they work in an economy that is 70 percent more productive. But our concern about the student debt crisis extends further than just the exponentially growing debt loads for today’s young people, it also includes scrutiny of companies profiting off of the crisis often at the expense of borrowers. Navient, one of two for-profit student loan servicers, is the largest and most notorious of such companies. Servicing one in every four federal student loan accounts, the company boasted profits of $5.24 billion in 2017. The company has a long history of borrower abuses from overcharging servicemembers to routinely funnelling borrowers into more costly repayment options, the company holds the top spot for most-complained-about entity in all of consumer finance in 2017, according to the Consumer Financial Protection Bureau. The company is now on the record for scuttling efforts to pass Student Loan Bill of Rights bills, legislation that would give student loan borrowers basic consumer protections, in multiple states. Adding insult to injury for borrowers, Navient stands to rake in $204 million in corporate tax savings from the Tax Cuts and Jobs Act, according to one estimate. The company is expected to pass on virtually all of their tax windfall to shareholders. According to press reports and by the company’s own admission, only 3 percent of the company’s tax windfall is going to their employees. This compensation is coming in the form of a one-time bonuses and not significant wage increases, which many corporations implied would’ve been generated by the tax law. 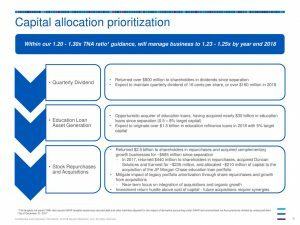 Further, public statements from the company confirm that investing in improving borrower services and outcomes do not fall within the top three priorities of the company’s capital allocation. Slide 9 from Navient Corp 2017 Q4 earnings call slides. In fact, some of the investments highlighted in their quarterly earnings report should be concerning to borrowers and advocates. The company is exploring plans to originate private loans in 2019. Years worth of analysis compiled by the CFPB shows us that private student loans can be the most dangerous kind of student loan debt, as these loans come with virtually no consumer protections or modification options for struggling borrowers and are subject to changeable and varying interest rates at the behest of banks and the lending market. Not only does the tax law disproportionately benefit the wealthy while vulnerable young people are struggling financially, it is enabling companies like Navient to further enrich their shareholders at the expense of borrowers, fund lobbying activities that derail state legislation to enshrine basic consumer protections for student borrowers, and potentially open new markets with few guardrails or accountability measures. Student Debt In The States – 2018 Edition.